A 1974 brochure about natural childbirth features photos of the emergence of Seth Green from his mother's womb. By the time he was 6, he was a veteran of several TV commercials. At 10, he made his first big-screen appearance in The Hotel New Hampshire (1984), as Jodie Foster's nightmare-plagued younger brother. At 13, he played a slightly fictionalized young Woody Allen in Radio Days. 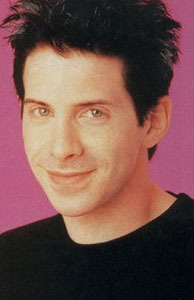 His more recent films include America's Sweethearts, The Italian Job, and Party Monster. He is best known for his role as Dr. Evil's son Scott in the Austin Powers movies. On TV's Buffy the Vampire Slayer, Green played a shy kid in a rock band who fell for Alyson Hannigan but then discovered he was a werewolf. He left Buffy in 1999 to deal with his film commitments. No stranger to animated television, Green has provided the voice of the fat teenaged son Chris Griffin on Family Guy since 1999. His stop-motion pop culture mashup barrage Robot Chicken debuted on the Cartoon Network's Adult Swim in 2005.